The Cuisinart CSB-300 is a Variable Speed Cordless Rechargeable Hand Blender with Electric Knife. The 2-cup chopper for nuts, cheese, and garlic or herbs will revolutionize your meal prep, giving your more time with your family or guests, while the electric knife attachment lets you carve meats or slice crusty bread and even tomatoes with ease right at the table, thanks to the cordless capability for 20 minutes of run time on a single charge. And with the 9.5 inch slim shaft, you can easily reach the bottom of any pot or pitcher, or whisk up a party-sized portion of whipped cream in no time at all. 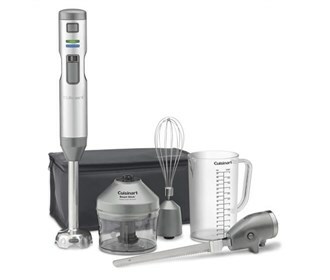 The Cuisinart Cordless Hand Blender has many exciting features for users of all types. You can extend the lifetime of your Cuisinart Cordless Hand Blender with the purchase of a FactoryOutletStore Factory Protection Plan. 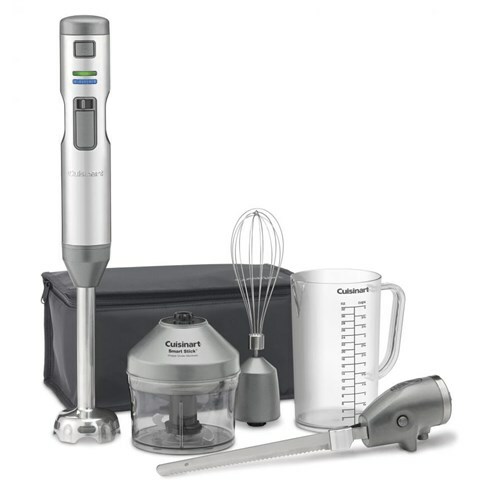 See the Cuisinart Cordless Hand Blender product video above for more details. The Cuisinart Cordless Hand Blender is sold as a Brand New Unopened Item.